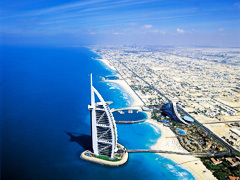 The Burj al Arab hotel has already become an international landmark and is the world's tallest hotel. The hotel's sail-shaped structure, soaring 321 metres above the Arabian Gulf, has become as much a point of reference in Dubai as the Eiffel Tower is in Paris. At this fine hotel the traditions of Arabic hospitality combine with the very latest technology to provide a new Middle East monument. With its helipad on the 28th floor and a restaurant seemingly suspended in mid air, the Burj al Arab hotel is known the world over and is a visual icon on the Dubai skyline. Al Muntaha Restaurant – Sky View Bar; enjoy delicious contemporary European cuisine 200m above the Arabian Gulf. Al Mahara - Seafood Restaurant approach the restaurant via a three-minute simulated submarine voyage from the hotel lobby. Junsui - offers a mouth-watering union of culinary delights from Japan, China, Thailand, Indonesia and Korea. Al Iwan Restaurant - enjoy a taste of the finest Arabian cuisine. Bab Al Yam - Poolside Restaurant that provides informal dining with attractive sea views. Majlis Al Bahar – beachfront restaurant located on the private beach specializes in Modern Mediterranean and Middle Eastern dishes, with plenty of lighter options. Sahn Eddar – lobby Lounge where you can enjoy your morning coffee, individual chocolate fountains or afternoon tea. Assawan Spa, a lavishly decorated, private health and fitness facility, named after the Assawan stone, which is known for its purity and healing properties. Its unique location allows guests to enjoy a spectacular view from the Jacuzzis, spas and pools as well as the massage, beauty and therapy rooms and even the aerobic room. Separate ladies and gentlemen’s facilities offer complete seclusion for guests seeking relaxing and reviving treatments in the hands of the most highly trained professionals. The extravagant décor is reminiscent of bathing pools used by ancient Middle Eastern civilizations, with a colour scheme representing the UAE national flag. The sumptuous décor of Al Falak Ballroom and the conference suites is inspired by an 18th Century Viennese opera house with an outdoor terrace. Accessible via its atmospheric veranda, the ballroom has marble pillars encompassing a central gold dome, with a dazzling crystal chandelier as a centrepiece. Complementing the ballroom is a series of five conference suites, each with seating capacities of up to 40 people, all equipped with sophisticated facilities and equipment. Dubai International Airport is approximately 30 mins drive. The hotel has one of the world’s largest fleets of Rolls Royce’s (including Park Wards, Silver Seraphs and Phantoms) all of which are available for guest transfers. Exclusive helicopter transfers to and from Dubai International Airport can be arranged.